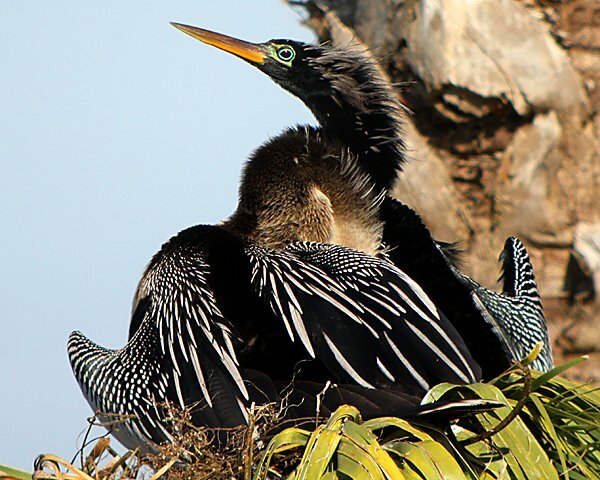 Anhinga, otherwise known as Snakebird, Water Turkey, or American Darter* – and more formally as Anhinga anhinga – is a bird I have long wanted to see in New York State. Being of bird of warm southern climes it is extremely unlikely but I often did my darnedest to turn a Double-crested Cormorant in flight into an Anhinga, with no success to speak of. In fact, prior to my visit to Florida in January for the Space Coast Birding and Wildlife Festival, I had never seen an Anhinga at all save one lousy look in Honduras back in 2009. You can imagine my desire to rectify that situation, and rectified the situation was on my first morning in Florida when Jeff Gordon pointed one out at Merritt Island. In fact, he pointed out the exact same bird as the bird below. The bird was clearly identifiable and I was pleased to add it to my ABA list but I wanted better light, better plumage, and better pictures. I didn’t go out of my way to track down Anhingas on my remaining days in Florida but I did keep an eye out for more opportunities to study and photograph them. One of the main things I learned is that they are often seen in flight and their flight style, shape and size all combine to completely befuddle birders (like me!) who are not used to seeing them. I must of mistaken flying Anhingas for ten different species over the next few days and I never really adjusted to seeing a cormorant-like bird soaring. 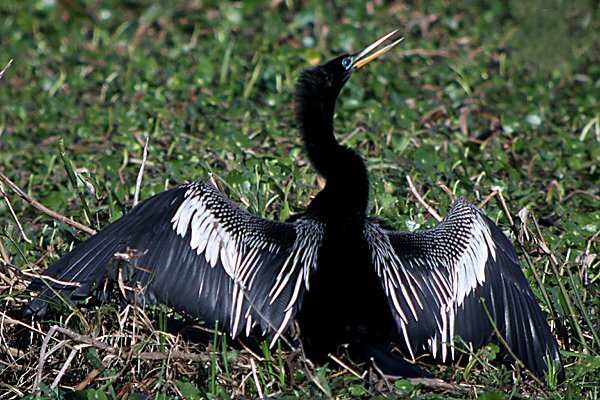 I don’t think that I will ever again try to turn a cormorant into an Anhinga – the flight styles are radically different and there really is no mistaking one for the other. 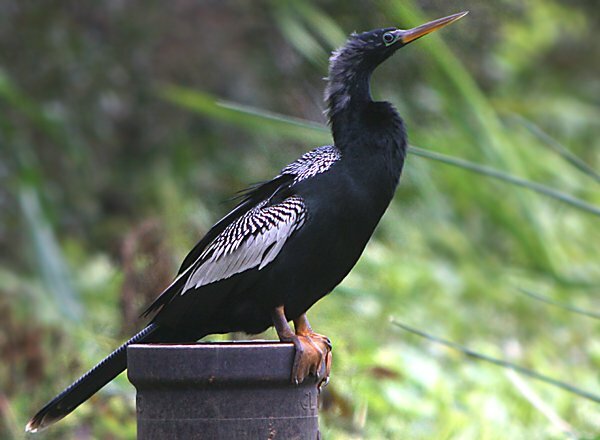 But the Anhinga is cool for reasons beyond its unique flight profile. I failed to get a picture of the behavior but when it swims only its neck and head are above the surface of the water. And their plumage, especially their breeding finery, is a sight to see. 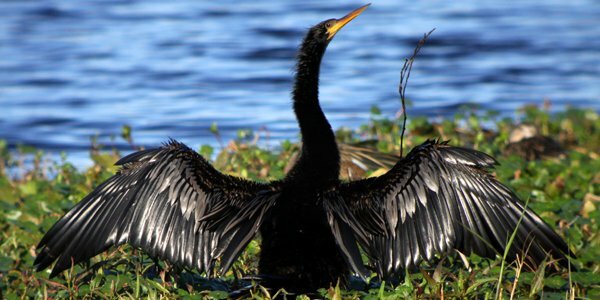 Like cormorants, Anhingas must dry their wings after spending time swimming after prey. And, like cormorants, they provide a nice photo-op when doing so. 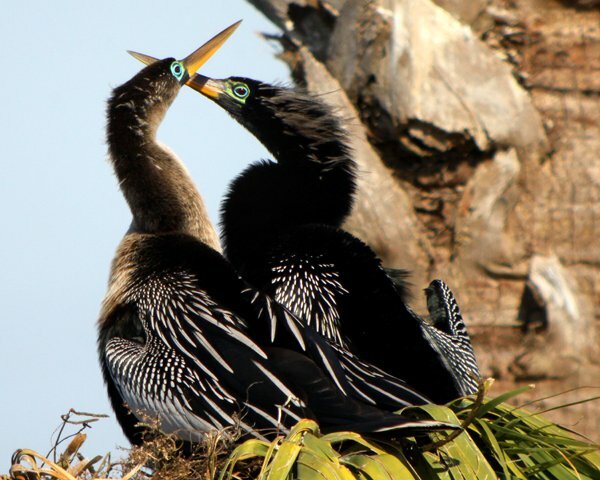 Anhingas are awesome! And that is pretty much all I have to say. 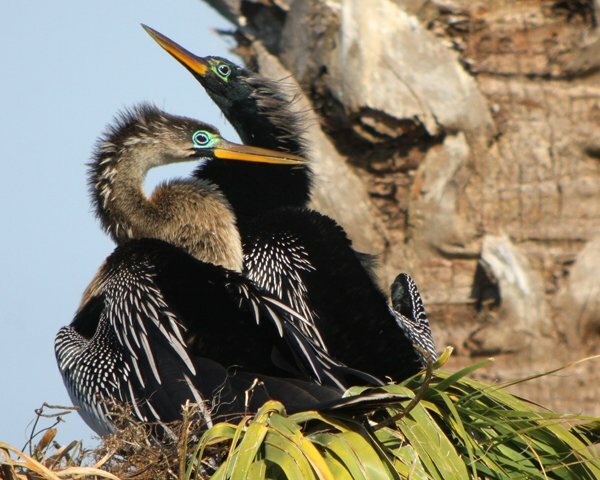 *This is because the other three birds in its family (Anhingidae) and genus (Anhinga) are all called darters – Oriental Darter, African Darter, and Australasian Darter. 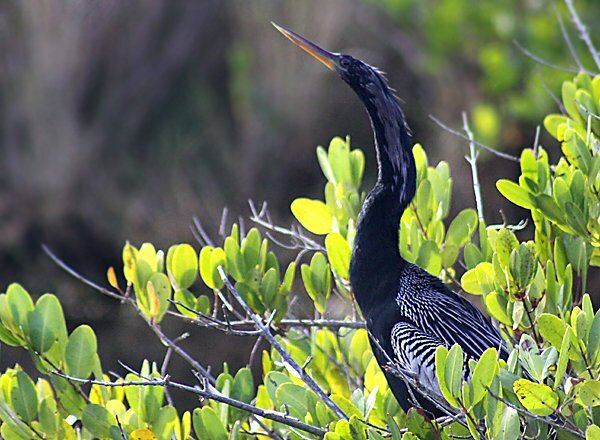 The other nickname, Snakebird, refer to its long neck but, honestly, I am not sure why it would ever be called a Water Turkey. But, but,… did you see it do a funky dance?! Great photos of that amazing plumage and gorgeous eyes! @Wendy: Thanks! And they are pretty birds, aren’t they? Mmm, that reminds me of an “anhinga-like” bird I saw with 2 other birders during a big day last year. Bird was soaring in a thermal without any wingbeat…..take a look at that pic and let me know what you think!